Our economical Sidewalk Signs make great portable and affordable "Point Of Purchase" signs for advertising your business or event. Perfect for retail stores, restaurants, repairs shops, schools, Churches, etc. These Sidewalk Signs are complete with the stand and the sign. You can choose from plain text or full color artistic layout for the sign face. We can add your logo, photo or graphics or create artwork for you. 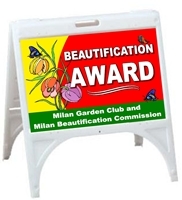 These Sidewalk Signs are portable which allows you to move them easily and place them where needed; on the sidewalk, lawn or in your building. Your announcement will get noticed and make a great impression. The sign faces are made using computer cut high performance vinyl or printed on high performance vinyl which is applied to corrugated plastic signboard. They are designed for long term use with UV stabilized materials built to last. Our sign engineers and designers are creative innovators that use the latest materials and manufacturing techniques. We use manufacturing processed that are efficient and allow us to create many more signs in less time than our competition. The result is huge savings and fast response to our customers with sacrificing quality. 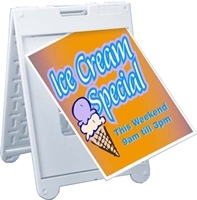 These Sidewalk Signs are affordable (starting as low as $108) and they they are available FAST; 3 to 4 business days after order & proof approval. 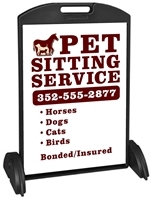 Call us today toll free at 888-454-0306 to talk with a Customer Service Person to discuss your sign advertising needs. You may also email us at sales@signstuff.com for more information. We are ready to help you 24 hours a day. Call us at 888-454-0306 to discuss your design requirements or to place an order.